OMG these are amazing! The crust is vanilla and buttery and the filling is creamy, dense NYC cheesecake and perfectly delicious. I was trying to use up leftover things in the fridge. A partially used jar of Dulce de Leche was just begging to be useful. I was looking at images of Dulce de Leche desserts and saw a cheesecake square with some Dulce de Leche on top and this inspired me. 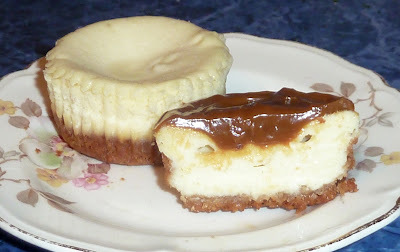 The recipe online called for mixing Dulce de Leche into the batter and on top of the cheesecakes. Maybe another time, this time I was in the mood for plain cheesecake. I decided to use my favorite cheesecake filling, Junior's. This was definitely the way for me to go since I was really craving some Junior’s cheesecake. Dulce de Leche is a heavenly tasting caramel like spread that is very popular in Latin America, Spain, Portugal and France. It is usually made by heating sweetened milk. In some countries they use goats milk, in others cows milk, and often cans of condensed milk are used. My jar was a store bought Gaucho Ranch brand. 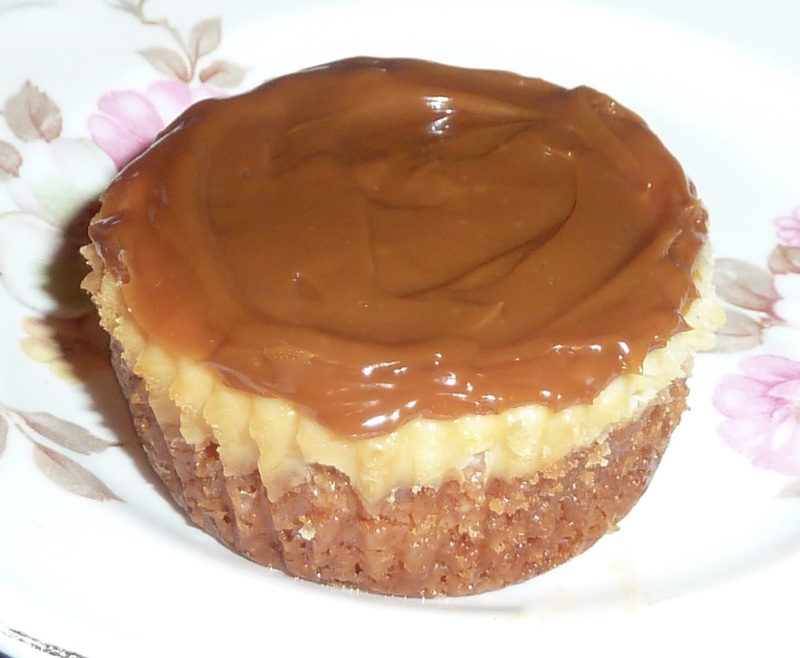 The mini cheesecakes are wonderful plain or with the Dulce de Leche topping. I had several, 7 to be exact, Glutino brand vanilla sandwich cookies threatening to go stale, so these were destined to become part of a cookie crust. I had seen a photo of a whole Oreo cookie used as the crust for a mini cheesecake and thought that this would have been really easy, if only there were more than 7 cookies left. I decided to crush the cookies in the food processor, but they were too sweet for my palate. To increase the volume and lower the sweet quotient I added some walnuts and ran them together with the cookie crumbs in the food processor. This worked well. I cut up cold butter and mixed it in with the crumbs and nuts in the food processor. No need to add any xanthan or guar gum to the crust since it would be held together by the cheesecake filling. The cookie crumb mixture was very wet and dough like, not crumb like, so I baked it for about 8 minutes before adding the cheesecake filling and baking it again. The crust came out perfectly. It is soft when you bite into it, yet firm enough to serve as a sturdy cheesecake base. 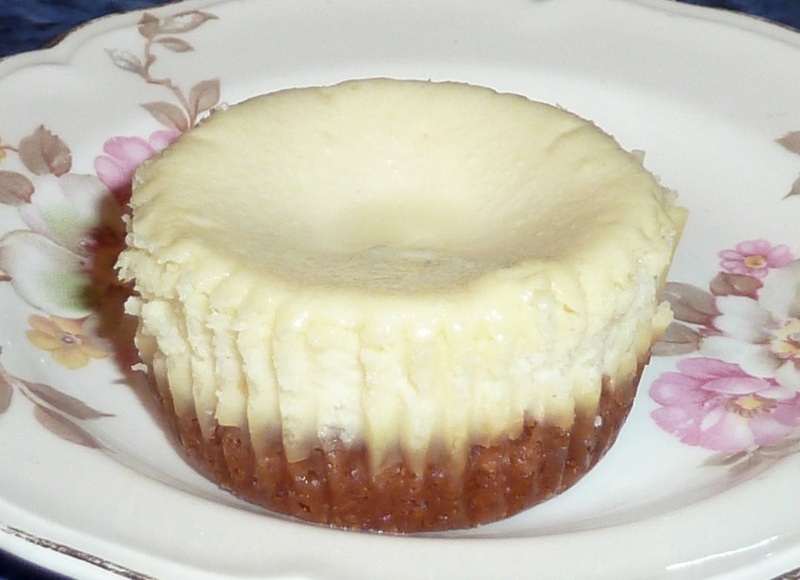 Mini cheesecakes are much easier to make, store and serve than regular sized cheesecakes. They will keep for 3 days in the fridge and can be frozen for longer storage and thawed as needed. Enjoy! ½ cup + 2 ½ Tbs. 1) Preheat oven to 350℉. Line a muffin tin with foil liners. 2) In a food processor pulse the cookies until they become fine crumbs. 3) Add the chopped walnuts and pulse until fine. 4) Cut the butter into small cubes and add to the crumb mixture. Pulse until the butter mixes in with the crumbs. Pressing the batter into the bottom of each foil cup liner. 5) Evenly distribute the crumbs among the foil liners and press the wet dough evenly along the bottom of each cup liner. 6) Bake for 8-10 minutes or until the crust is lightly browned and cooked in the center. 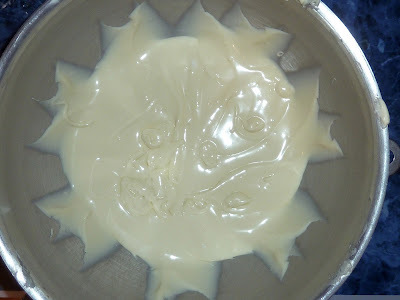 7) Allow to cool while you make the filling. 8) In the bowl of a stand mixer add 8 oz. of the cream cheese, 5 Tbs. of the sugar & the cornstarch and mix on low speed until smooth. Mixing the cream cheese, cornstarch and sugar. 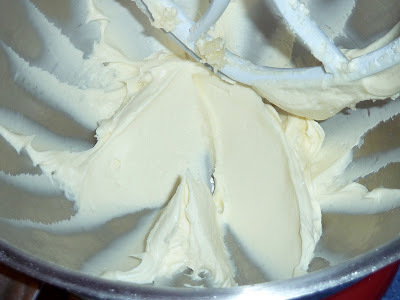 9) Add the rest of the cream cheese and mix until smooth. 10) With the mixer running on low, gradually add the rest of the sugar and the vanilla. Mix until combined. 11) Add the egg and blend in. Adding the egg to the filling. 12) Add the cream and mix in. The batter after the cream is mixed in. 13) Evenly divide the batter on top of the crusts. I used a scoop that measured 2” across to measure out the batter. 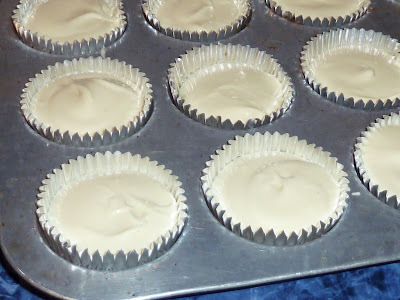 Hold each end of the muffin tin and firmly tap the muffin tin a few times on the counter top to release air bubbles. I forgot to do this and there were a few bubbles that collapsed into small holes after baking. Raw cheesecake filling in the cups. 14) Bake about 18 minutes until the batter is set with some wiggle left in the center. Turn and rotate the pans halfway through the baking time so that the cheesecakes bake more evenly. The cheesecakes right out of the oven. Note the domed tops and some bubbles. on the counter before baking to get air bubbles out. 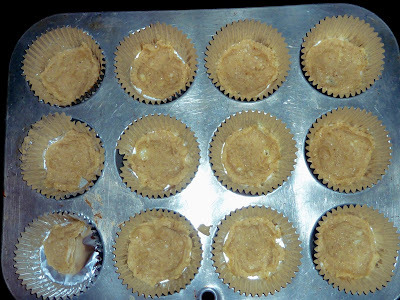 Note that the cakes flatten a bit and have some small holes that the bubbles left. 15) When done allow them to cool to room temperature and then cover and place them into the fridge to chill completely for at least 2 hours or overnight. 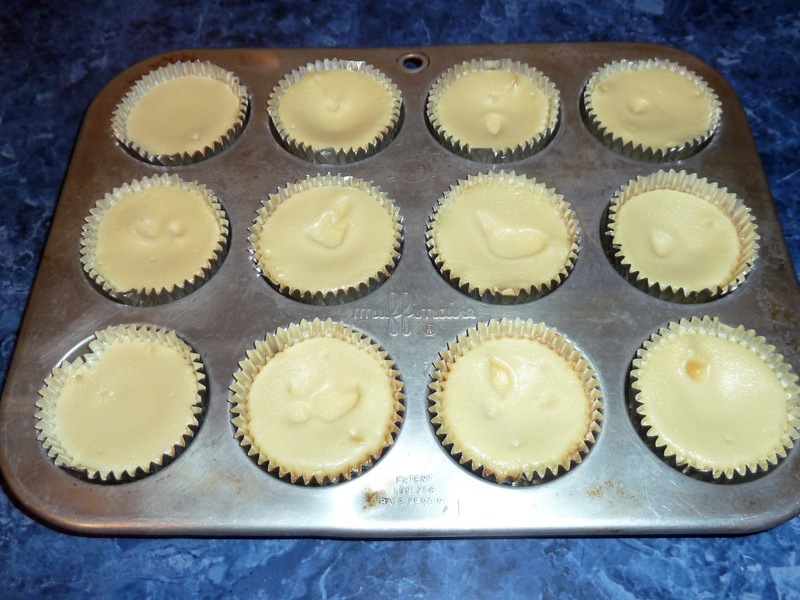 16) When completely cooled spread the tops of each mini cheesecake with some Dulce de Leche, if using. You can also just eat these plain or top them with some fruit topping. A peek at the inside of a cheesecake. GLUTEN FREE MINI CHEESECAKES WITH OPTIONAL DULCE DE LECHE TOPPING GlutenFreeBakingBear.com Makes about 16 mini cakes Ingredients CRUST 7 GF Vanilla Sandwich Cookies ¾ cup Chopped Walnuts ¼ cup/4 Tbs. Unsalted Butter FILLING 16 oz. Cream Cheese - full fat - at room temperature Divided 2 Tbs. Corn Starch ½ cup + 2 ½ Tbs. Sugar 1 ½ tsp. Vanilla Extract 1 large Egg 6 Tbs. Heavy Cream TOPPING 1 cup Dulce de Leche (optional) Directions 1) Preheat oven to 350℉. Line a muffin tin with foil liners. 2) In a food processor pulse the cookies until they become fine crumbs. 3) Add the chopped walnuts and pulse until fine. 4) Cut the butter into small cubes and add to the crumb mixture. Pulse until the butter mixes in with the crumbs. 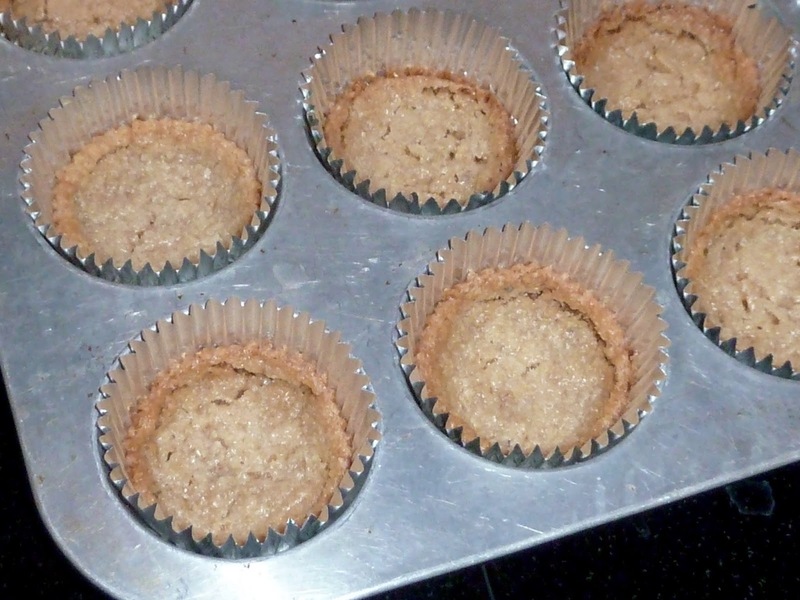 5) Evenly distribute the crumbs among the foil liners and press the wet dough evenly along the bottom of each cup liner. 6) Bake for 8-10 minutes or until the crust is lightly browned and cooked in the center. 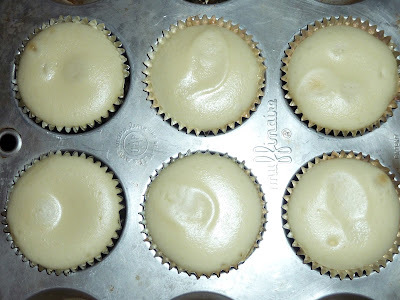 7) Allow to cool while you make the filling. 8) In the bowl of a stand mixer add 8 oz. of the cream cheese, 5 Tbs. of the sugar & the cornstarch and mix on low speed until smooth. 9) Add the rest of the cream cheese and mix until smooth. 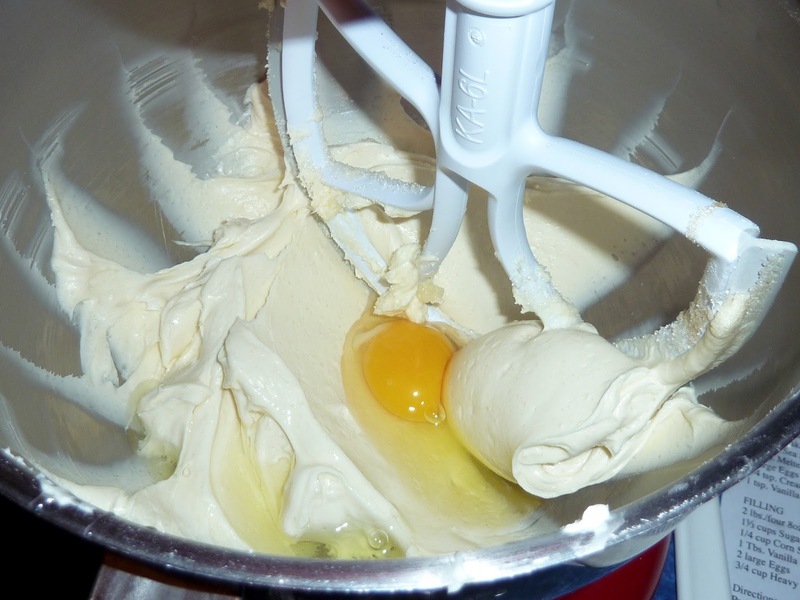 10) With the mixer running on low, gradually add the rest of the sugar and the vanilla. Mix until combined. 11) Add the egg and blend in. 12) Add the cream and mix in. 13) Evenly divide the batter on top of the crusts. I used a scoop that measured 2” across to measure out the batter. 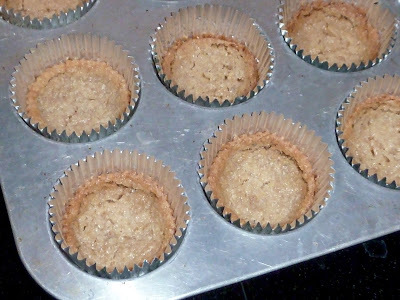 Hold each end of the muffin tin and firmly tap the muffin tin a few times on the counter top to release air bubbles. I forgot to do this and there were a few bubbles that collapsed into small holes after baking. 14) Bake about 18 minutes until the batter is set with some wiggle left in the center. 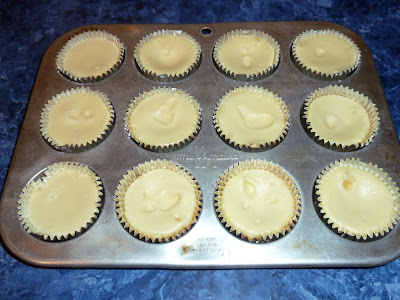 Turn and rotate the pans halfway through the baking time so that the cheesecakes bake more evenly. 15) When done allow them to cool to room temperature and then cover and place them into the fridge to chill completely for at least 2 hours or overnight. 16) When completely cooled spread the tops of each mini cheesecake with some Dulce de Leche, if using. You can also just eat these plain or top them with some fruit topping.